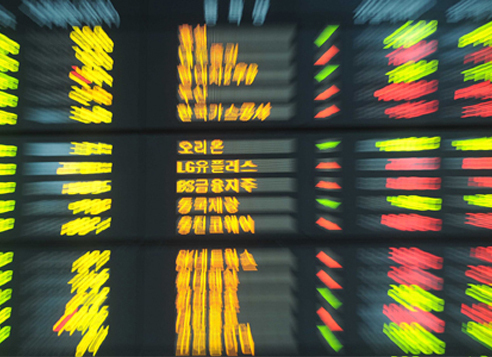 South Korean stocks widened losses in late Wednesday trading as foreigners and institutions offloaded stocks. The won rose against the US dollar. The benchmark Korea Composite Stock Price Index dropped 10.58 points, or 0.49 percent, to 2,137.88 as of 11:20 a.m.
Foreign and institutional investors offloaded a combined 60 billion won ($52.7 million) worth of stocks on profit-taking. Individuals bought stocks valued at 62 billion won, keeping the KOSPI from falling further. The KOSPI ended in positive territory in the past two sessions as investor sentiment was relieved after the United States didn't designate South Korea as a currency manipulator. Blue chip stocks led losses. Market bellwether Samsung Electronics fell 0.96 percent, top carmaker Hyundai Motor declined 2.48 percent and No. 2 carmaker Kia Motors fell 2.16 percent. Among gainers, No. 1 cosmetics company AmorePacifc advanced 2.10 percent, industry leader SK Telecom gained 0.92 percent and dominant tobacco company KT&G rose 0.50 percent.